Party officials tell Arutz Sheva Jewish Home will remain in coalition only if Bennett tapped to replace Liberman as Defense Minister. 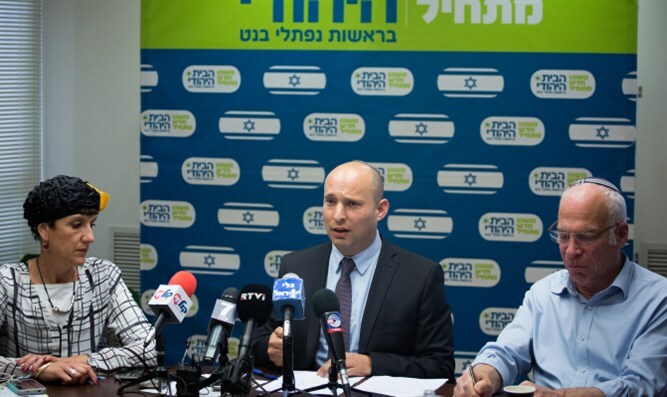 With Avigdor Liberman’s sudden departure from the Defense Ministry and the Netanyahu government, the Jewish Home is looking to secure party chief Naftali Bennett as Liberman’s successor. Senior officials in the Jewish Home party told Arutz Sheva on Wednesday following Liberman’s announcement regarding his planned resignation that the faction will also leave the coalition if Bennett is not tapped to replace Liberman in the Defense Ministry. On Wednesday morning, Liberman called a press conference following a special meeting of Yisrael Beytenu party members, fueling speculation he was preparing to quit as Defense Minister. Liberman later confirmed that he was indeed planning to tender his resignation, and called for early elections. "I'm here to announce my resignation as Defense Minister for the State of Israel,” Liberman told reporters at a press conference. Even before Liberman formally announced his plans, however, leaders of the Jewish Home faction began lobbying to secure party chief Naftali Bennett’s place as Liberman’s successor at the Defense Ministry. “Now is the time to demand the Defense Ministry portfolio be given to Naftali Bennett and the Jewish Home,” tweeted MK Shuli Muallem.